Capillary action requires only one micro liter of blood for sampling. Strips are large enough to handle easily. Flip-top cap remains attached to bottle and is easy to open. 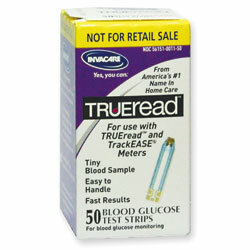 For use with TRUEread Blood Glucose Monitoring System. 50 strips per package.